Palestinians sources in Gaza Strip reported Thursday that IAF aircrafts struck targets in the southwestern Gaza neighborhood of Sudaniya. Medical sources in the Strip reported that two Islamic Jihad operatives were killed. Military sources said that the strike targeted a terror cell gearing to fire projectiles at Israel. It followed yet another rocket salvo at Israel's south, which gnawed further in the fragile armistice achieved with Gaza's terror groups. Gaza groups out to challenge Hamas? Ten Qassam rockets were fired at Israel's south on Thursday evening, exploding in open areas in the Eshkol, Sha'ar Hanegev and Hof Ashkelon Regional Councils. No injuries were reported.The Color Red alert sounded beforehand. 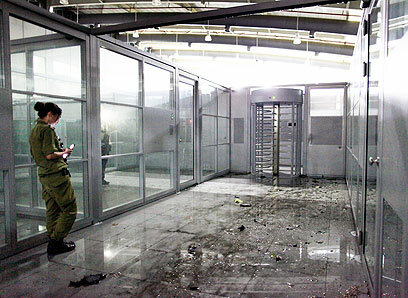 The IDF confirmed that a mortar shell fired from Gaza damaged a building in Erez crossing. No injuries were reported. The crossing was closed and security forces evacuated the Palestinians present on the premises to safety. Earlier Thursday, a projectile exploded in open territory in the Sdot Negev Regional Council. No injuries were reported but damage was caused to a high voltage line. Meanwhile, Islamic Jihad Deputy Secretary General Ziad a-Nahala said that his organization was not interested in an escalation in Gaza, the London-based daily al-Hayat reported on Thursday. On Wednesday night, At least 20 rockets were fired at Israel's southern communities with calm nowhere in sight. A 9-month-old baby sustained light to moderate wounds in the attack. Earlier, Palestinian sources in the Gaza Strip reported that rescue forces have discovered two more bodies in a tunnel following the Israeli Air Force bombardment Wednesday night. A third Palestinian is still missing. According to a-Nahala, the group has updated the Egyptians that it was in a defensive rather than offensive position. However, he added that "we won't agree to a cease-fire in which only one side holds its fire nor will we be committed to a calm as we are attacked." A senior Islamic Jihad member was killed by an IAF jet on Wednesday. According to defense officials, he was in charge of the funding for last week's terroist attacks near Eilat. On Thursday morning, the Home Front Command published safety guidelines to Gaza vicinity communities and residents living in southern Israel, instructing them not to hold gatherings of over 500 participants due to the recent escalation. Further instructions also forbid holding classes in unshielded structures. See all talkbacks "Rocket salvo hits south; IAF strikes Gaza "